It was a week of pure political theater, a disgrace to everything this country used to stand for, and Democrats loved every minute of what they’d created. Between the faux outrage and the pearl-clutching across liberal Washington, there wasn’t a fainting couch that wasn’t engaged. It was all garbage. We will never know happened to Christine Blasey Ford in the early 80s, even after she tells her story. Frankly, I don’t care anymore. When she first came forward I was willing to hear her out. It quickly became clear, whatever her story was, that her story didn’t matter. By Monday it was a liberal feeding frenzy and I was out. In a country with more than a million lawyers, Ford ran into the arms of a liberal activist attorney you’d pick if you were looking for a political outcome, not justice. Maybe she was poorly advised by the Democrats she’d come out to months earlier, or maybe she was a willing participant. But people looking for justice don’t both want to remain anonymous and hire a lawyer, contact the media on background, take a polygraph test, and wipe clean their Internet footprint without some semblance of a plan. Either Ford is a naïve 50-something woman with a Ph.D. or she’s a willing participant in this garbage show. It no longer really matters which. If it did, if she were sincere, she wouldn’t be a willing participant in this circus. On Monday, her lawyer and Democrats demanded she be allowed to testify. They insisted she was eager to do it. When Republicans immediately agreed, the demand changed to requiring an FBI investigation first. This occurred despite there being nothing for the FBI to investigate, since her story has evolved slightly but still lacks any details that could prove or disprove anything. Once that attempt at delay was played out, Republicans set a deadline: decide to testify by Friday at 10:00 am or there will be a Committee vote Monday. She also wanted Judge Kavanaugh to testify first. While Kavanaugh has been unequivocal in his denials and never waived from his commitment to rebut any allegation, you can’t rebut allegations that haven’t been testified to. The accused never goes first, it’s un-American. That didn’t matter, Democrats were immediately on board because they wanted anything to delay the process further. The concept of not allowing Ford and her team to dictate how the United State Senate conducts its business was irrelevant, and anything short of complete appeasement was declared “bullying.” In fact, everything was declared bullying. Every time Republicans agreed to what she wanted they were called bullies, chastised for “re-traumatizing” Ford for not agreeing to simply believe her. Guilty was the only answer they’d accept, though they’d likely declare that not enough if they’d gotten it. 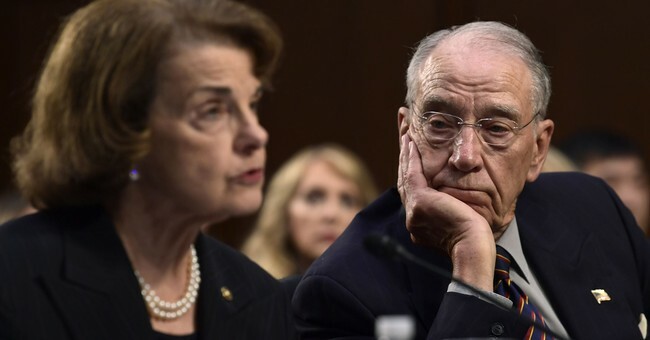 Senator Chuck Grassley, Chairman of the Judiciary Committee, kept setting deadlines for her to agree to testify or he’d call for a vote. She wouldn’t, then he’d change them. His leadership made Barack Obama look strong on chemical weapons use in Syria. On Friday, Ford came up with a new excuse as to why she can’t testify on Monday – she’s uncomfortable with confined spaces, so she won’t fly to DC. She’ll drive, probably, but couldn’t possibly make it till Thursday. She’s had all week to decide this, but didn’t mention anything about this “phobia” until yet another deadline approached. It worked, Grassley’s deadline was moved again. There was no bullying and there was nothing more Republicans could do to hear her story, her team was delaying again because delay was their only play. Feinstein’s lies were not unique to her. Miraculously, every Democrat and journalist switched stories the way a baby has their diaper changed, and none of them missed a beat or were bothered by contradicting themselves, sometimes from just hours earlier. It was disgusting. I don’t know what happened for Ford, but I do know she doesn’t want to talk about it under oath. In the past 2 months, she’s talked to probably dozens of Democrats at this point, elected and activist, the Washington Post on multiple occasions, a therapist, a polygraph operator, her husband, friends, but no one under oath. Kavanaugh has submitted a statement that is subject to perjury laws, as have the others Ford said were at the party she can’t remember the location or year of, but she hasn’t. Her team is doing everything possible to avoid it, they want this hanging out there as long as possible to weaponize the charge without having it questioned. The Soviet Union used to do this, not America. Facts no longer matter when the target is a conservative. Reality is whatever liberals want it to be at any given moment and whatever they declared it to be beforehand, even if it was the exact opposite of what they say it is now, doesn’t matter and it’s bullying to point it out. It needs to stop. But Democrats won’t stop doing it because they pay no price for it, the “referees” in the media are wearing a blue uniform under their suits. The only way this madness stops is for it to stop working on Republicans. The “moderate” Senate Republicans need to choose to put the country over their reelection. They’d likely be surprised to find having a spine is good for job security. All Republicans would likely find the same thing. Enough is enough, it’s time to stop begging Ford to testify and simply move on. When she shows up on 60 Minutes, telling her story in yet another venue that won’t question her in any serious way, it won’t be lost on the public that she was given more opportunities to testify than anyone in modern history yet always only ever chose partisan outlets. For someone uncomfortable telling her story, liberals seem to think she’d be willing to tell it just before the midterms. So what? It’s time to hold the vote. It’s time to confirm Judge Kavanaugh. You can only give someone everything they want so many times before you have to accept that they really wanted something else, in this case it’s delay. There will be another outrage, either way. The entire Democratic Party campaign strategy is to keep their base angry and afraid to motivate them to the polls. The only way to counter that outrage is to deliver on promises and stand up to it like that guy stood up to the tanks in Tiananmen Square, because it’s the same philosophy driving both. Hold the damn vote already. PS: I detail how liberals use emotion to manipulate the public in cases like this in my book, “Outrage, INC.: How the Liberal Mob Ruined Science, Journalism, and Hollywood.” Don’t take my word for it, take the words ofMark Levin,Ann Coulter,David Limbaugh,Dana Loesch,Dan Bongino,Michelle Malkin,Ben Shapiro,Kurt Schlichter, and countless others. I discussed the book with Brent Bozell, founder of the Media Research Center, on CSPAN’s Book TV.You can watch the discussion here. Andsubscribe to my podcastto hear daily dissections of the news, how the left is doing whatever it takes to win in November, and why that would be devastating to the cause of liberty.